For years, the biggest argument against the Star Wars franchise was that there wasn’t a prominent female Jedi. Well, with the release of Episode VII: The Force Awakens this December, that argument is no longer valid, as fans everywhere will rejoice as they’re introduced to a new cast of characters, including Rey from the world of Jakku. 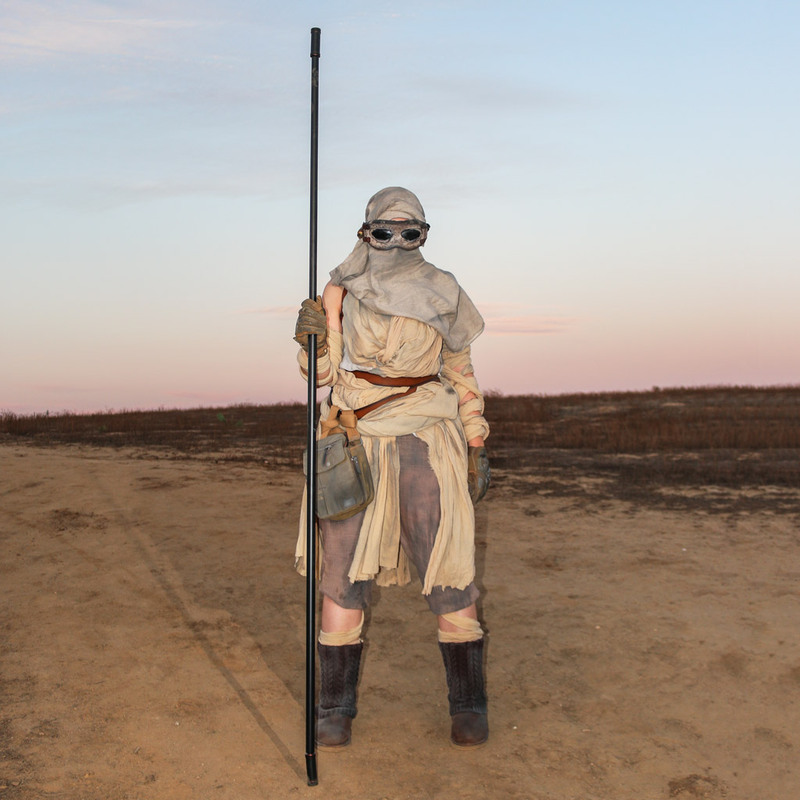 She roams the galaxy approximately thirty years after the Battle of Endor, and now you can dress like her, in tan, desert-friendly clothes, including the scarf around her head. The only difference is that YOUR visor won’t be made from the remnants of an authentic stormtrooper’s helmet. The goggles are the most epic part of the costume. It looked like it was multiple layers of fabric on her goggles. 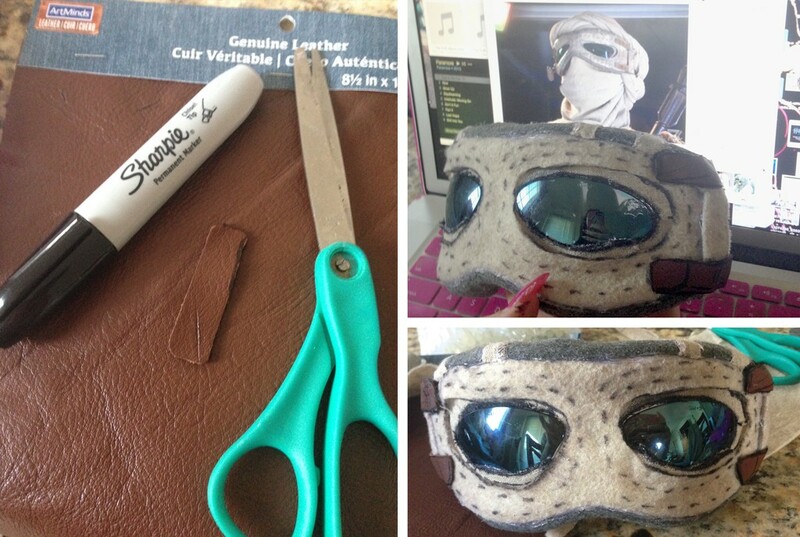 Start with 2 different types of goggles. Pop the blue lenses out of one pair and stick them onto the clear pair with E6000 glue after covering them in linen fabric. Use a piece of craft leather to add the rusty leather strips on the sides. With a thick black permanent marker, add in line detail and some shading to give it more depth. Cover the gold metal piece in bronze paint to make it look weathered. Use the remaining leather pieces to glue it onto the side. 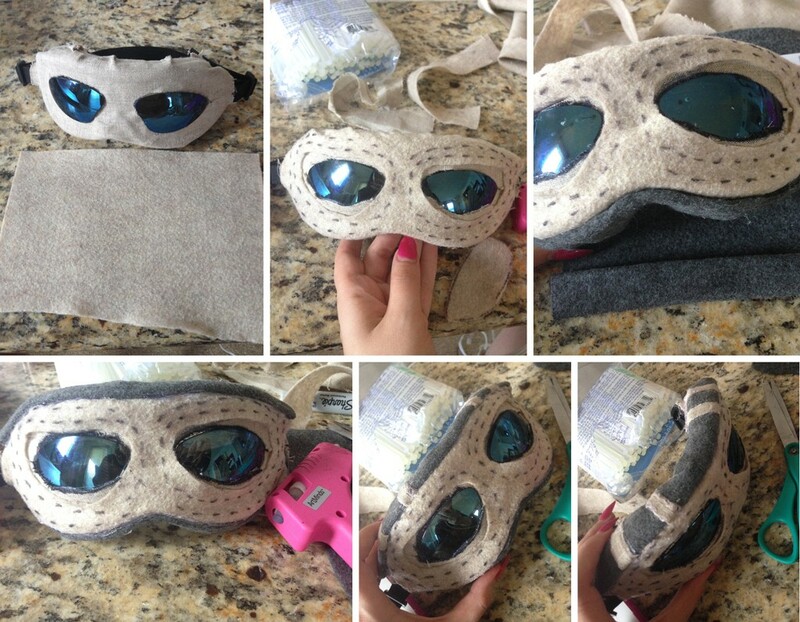 Lightly spray some grey and black paint onto the goggles and hand paint details on with a sponge until it looks the way you want. Here’s an easy option to DIY the staff: find a curtain rod that looks like a good base to use. This way, you can adjust the length. Add cloth detail, and customize the top and bottom of the staff. These gloves are perfect. They look rugged enough to ride Rey’s speeder. The material for Rey’s boots looks like wool and similar to Ugg Boots. These boots were perfect as they had a similar knit wool texture. Spray them with almond, black, and rusty brown paint to give a dusty look. For Rey’s shirt, use a white Chiffon tank and cut it into a V-neck. Sew the edges on the neckline. This shirt should be billowy and long enough to sew the dress onto. Spray this dress with the brown, black, and beige on the edges and leave the center white. For this project, 13 yards of beige Cotton Gauze fabric were used. This was the most expensive part of the costume, but well-worth the investment. It billows nicely and is translucent to the light coming through, but thick enough to be opaque if pleated. First, pin all of the pieces onto a dress form to achieve the perfect fit or drape around yourself and pin as you go. Save yourself some trouble and have someone help with this. Pinch the fabric into pleats in to gather at the shoulders. 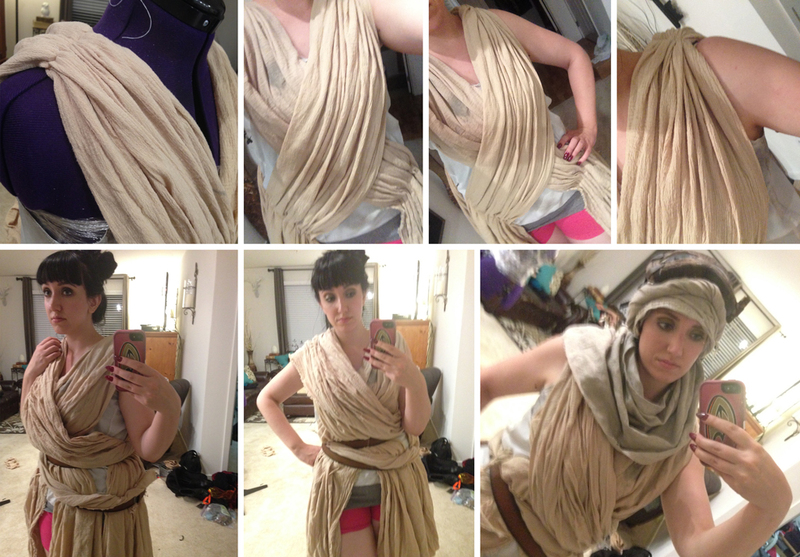 Drape the gathered fabric across the chest. 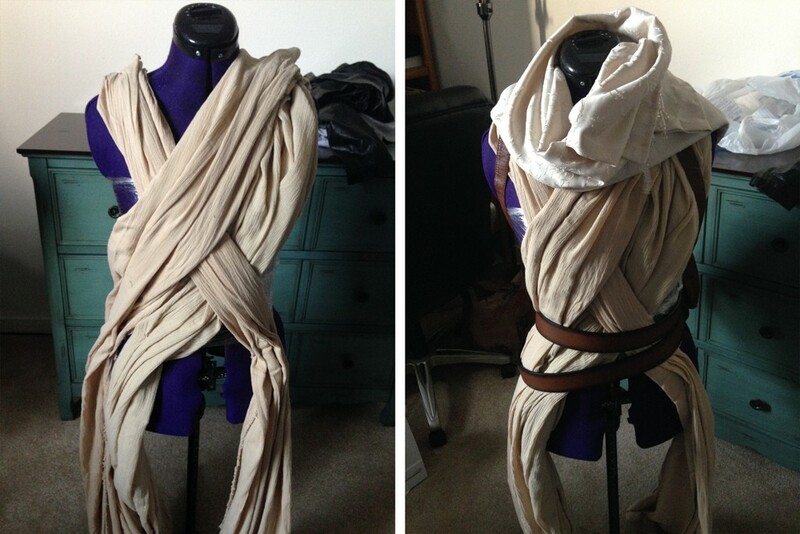 Sew the four pieces of fabric onto the white shirt and place it where it would fit on my body. This will keep it from unraveling. Take the additional pieces and sew them to pieces that you already sewed on. This is where you can get most creative because you are able to fit this exactly to your body. Take the “shirt” off and place it back onto a dress form or lay out flat and spray it with black, brown, and beige to give it more dimension. Highlight the shoulders and the four ends of the fabric more to make them stand out. Once it dries, wet it in cold water and toss it in the dryer so it isn’t as stiff. Rey’s pants are a pure silk in the movie and looked very Bohemian-style. These pants were a perfect fit and looked the part. Spray them with black, brown, and almond paint to give them more dimension. 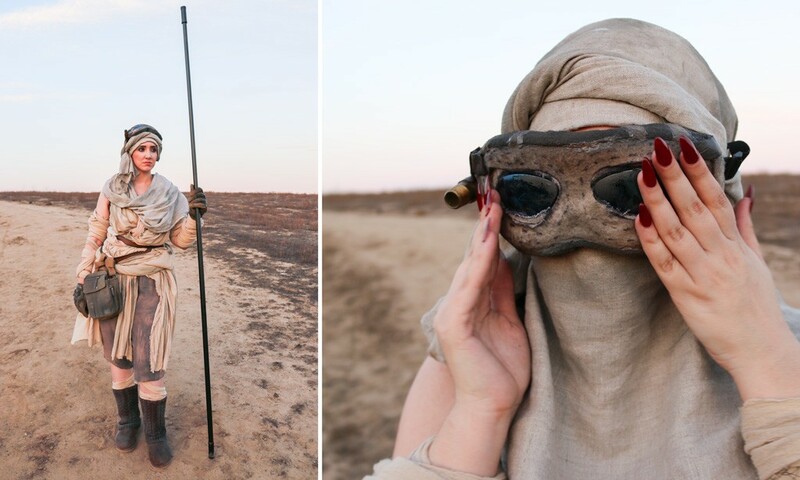 The cowl should be something that is strong enough to twist around your head but it has to look like it could hold up in the desert. About 3 yards of beige linen fabric worked for this part of the outfit. Place the cowl around your head like a headscarf and pin it in the back. Then use the two ends to twist around your head and pin on one side and used the other side to drape around your neck and shoulders. Alternatively, this piece of fabric can cover your mouth like the costume photo. Spray this with brown, black, and beige to make it look like it’s been through quite a few desert storms. This square-shaped Canvas bag from Amazon works great as Rey’s bag. Hook it onto the belts. Spray it with brown, black, and silver to look like it’s been worn out in the desert. Rey’s backpack is a rusty leather backpack with 2 canteens underneath and on the sides. Find a similar bag online or in a thrift store. Spray paint the backpack with silver, almond, and black to give it a rugged feel. 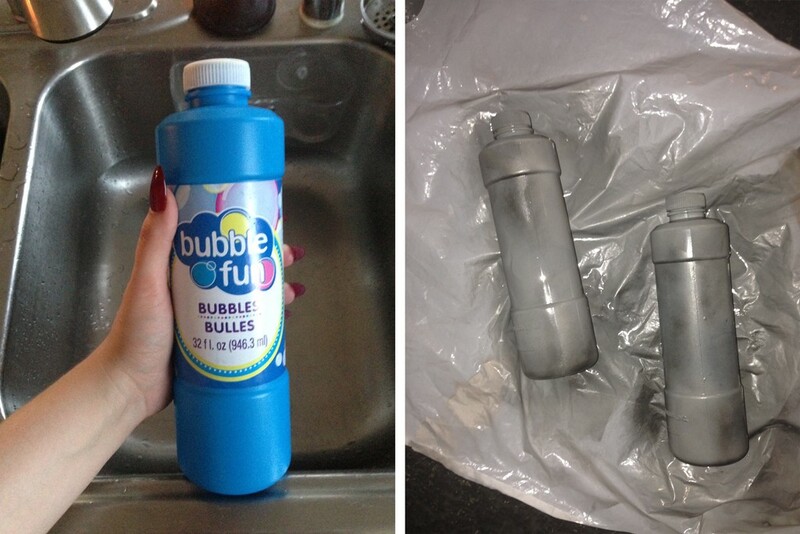 For the canteens, empty two large bottle of bubbles from the Dollar Store, spray paint them metallic silver with black shading. Find belts that match the black shading on the outside and the rusty brown in the center. Or use paint on brown belts to match the look. Use left over Cotton Gauze fabric for the arm and leg wraps. 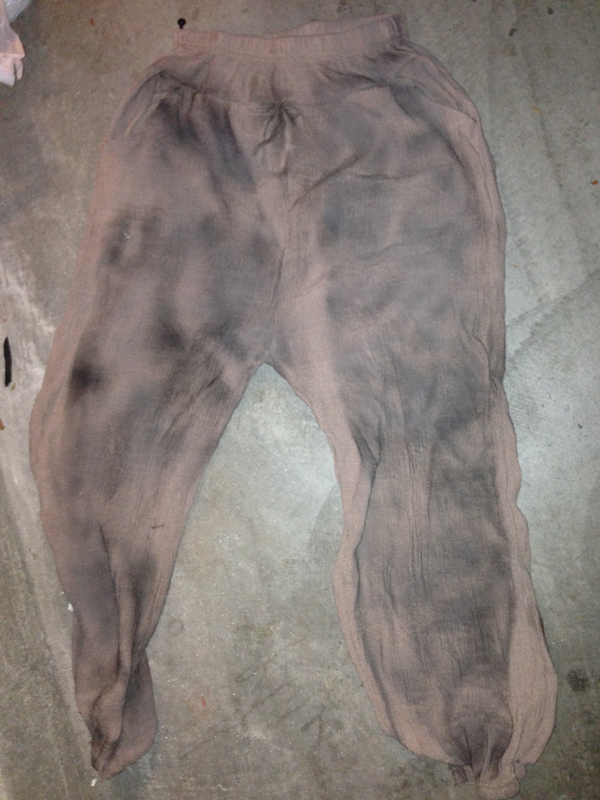 Spray them with black, brown, and silver to give an aged look. Cut them into four pieces and sew or safety-pin them to the shirt and pants for them to stay in place when moving around. Rey’s makeup is very natural and bronzey. A strong brow, bronzer on the cheeks, and light brown on the eyes finish the look. 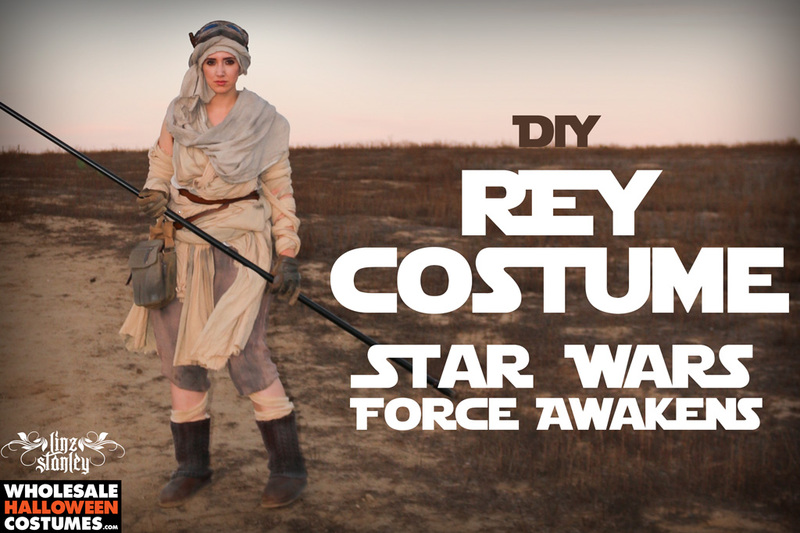 You might not drive a landspeeder, but you can awaken the force by making your very own Rey costume with help from this DIY tutorial this October. Do you prefer the classic characters like Chewbacca and Darth Vader? Check out the Star Wars costumes already in stock at Wholesale Halloween Costumes!